The Phillips Curve shows the empirical relationship between the unemployment rate and the inflation rate: more unemployment means less inflation and vice versa. The implication is that higher prices lead to an increase in real output. 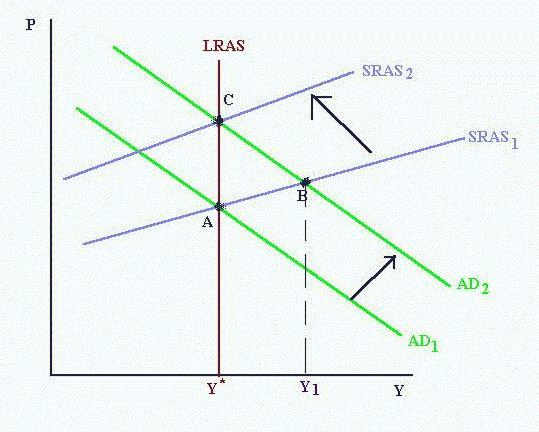 Therefore, the aggregate supply curve must slope upwards in, at least, the short run. 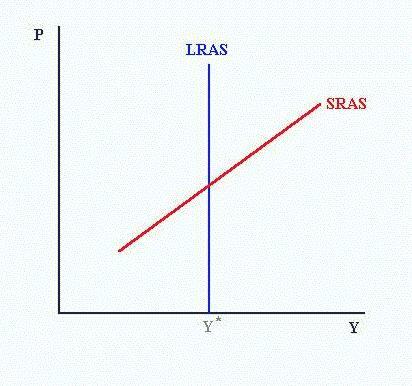 Although the long-run aggregate supply curve (LRAS) is vertical at Y*, the equilibrium level of real output, the short-run aggregate supply curve (SRAS) is upward-sloping. Why? Output rises above Y* when the price level is higher than expected. The idea is that people confuse a rise in the general price level (to which they should not respond) with a rise in the relative price of what they produce (to which they should respond by increasing output). Real wages vary only slightly over the business cycle. According to the classical model, declines in employment during a recession reflect voluntary decisions by workers to work less in response to lower real wages. The efficiency wage model is based on this last idea: firms do not reduce wages in the face of persistent unemployment because to do so would reduce productivity. A worker's productivity might depend on the real wage for several reasons. First, lower paid workers are less loyal to the firm. Second, wage reduction makes the best workers quit. Third, lower wage reduce the costs of getting fired to employees so they do not work as hard and as efficiently. If high wages increase workers' productivity by enough, it could be profitable for an employer to pay wages higher than the market clearing level. Paying high wages may also reduce the frequency of quits thereby saving firms the costs of hiring and training new workers. By reducing shirking and cutting supervision costs, a relatively high real wage may increase the employer's profits. The effort curve is based on the idea that workers' effort depends on the real wage they receive. At low wage levels, hardly any effort is offered. Effort rises only slowly as the real wage increases. The curve flattens out because there is some maximum level of effort workers can supply no matter how motivated they are. Firms will choose to pay the real wage that achieves the highest effort per dollar of wages. This is the efficiency wage. It is found by drawing a line from the origin tangent to the effort curve. 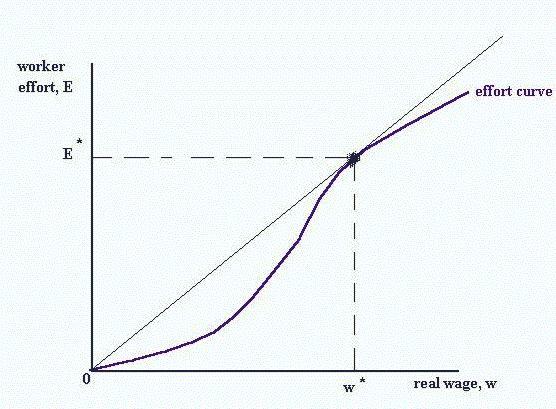 Efficiency wage theory helps to explain real wage rigidity. As long as the effort curve does not change, the employer will not change the real wage. The level of employment depends only on labor demand. Labor demand depends on MPN. 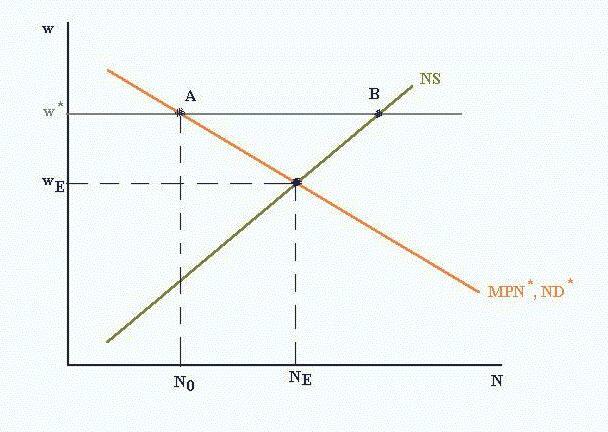 Let MPN* equal the marginal product of labor when worker effort is E*. Employers know that workers working at wE will not put out as much effort per dollar of real wages as workers receiving w*. So, unemployment can continue indefinitely. Nominal price stickiness occurs when a price does not quickly change in response to changes in supply or demand. To account for the empirical non-neutrality of money, the classical model assumes that producers have imperfect information about the price level. If prices are sticky, they cannot adjust immediately to offset changes in the money supply so that money is not neutral. The combination of monopolistic competition and menu costs provide a Keynesian explanation for nominal price stickiness. Menu costs include the physical costs of changing prices as well as the time taken to inform customers, the customer annoyance caused by price changes, and the effort required even to think about a price change. Monopolistically competitive firms have some power to set prices. They will not change their prices unless the profit-maximizing price and the existing price differ by enough to make it worthwhile to incur the menu cost to change the price. With prices fixed, firms adjust production to meet the demand for their output. With any increase in aggregate demand, some firms will find it profitable to raise their price while others will increase output. 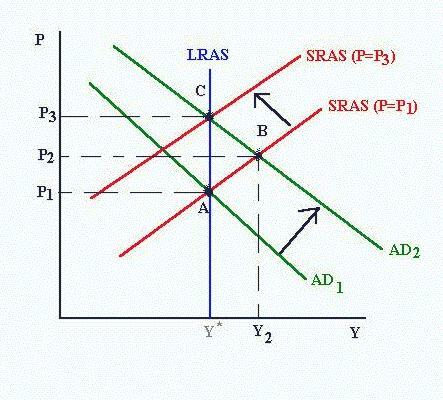 So, the short run aggregate supply curve is upward sloping, and there is a different SRAS for each expected price level. Suppose there is an increase in the money supply. The real interest rate will fall, stimulating an increase in consumption and investment spending. The AD curve will shift up to the right. The short-run equilibrium moves to point B. Real output has risen. Eventually prices will adjust and the SRAS will shift up until equilibrium is reached at Y*. Money is not neutral in the short run but is neutral in the long run.